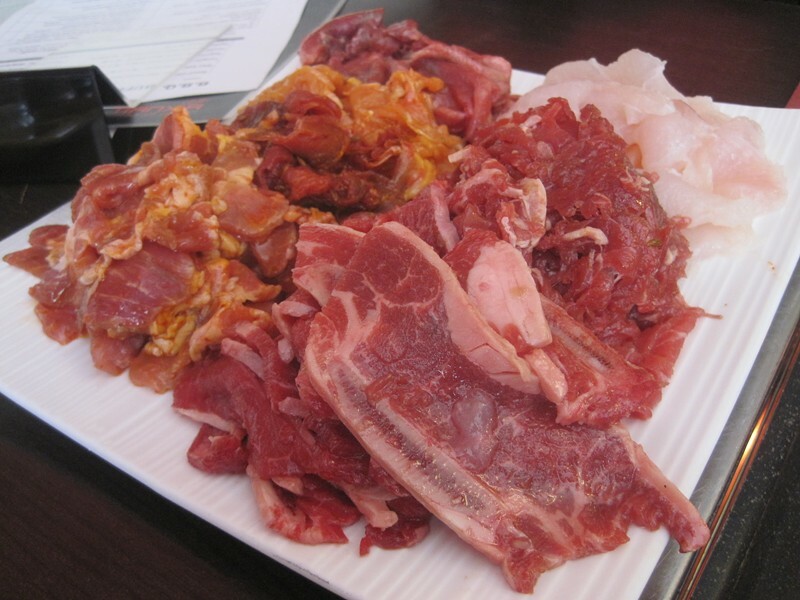 I have a soft spot for all Korean barbecue, but I'm just too greedy to order a plate each of bulgogi and galbi. That's why, whenever possible, I frequent all-you-can-eat versions of the grill-your-own restaurants. Usually this means a menu composed mostly of meats to cook yourself on the grill on your table. At Tianxia, more than half the menu is fun-size versions of cooked Korean dishes. 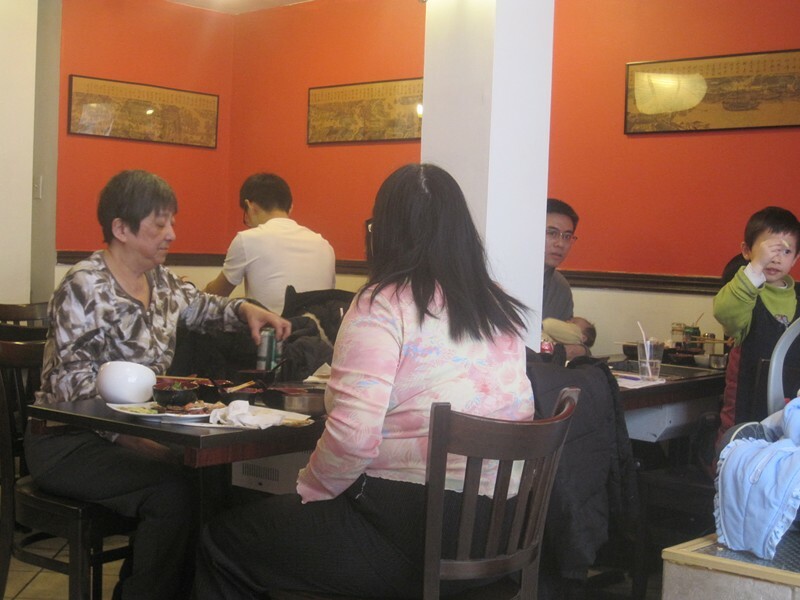 After we were seated at the busy, casual restaurant, we were presented with a paper sheet on which to check what we'd like to eat, all for a single price of $20.99, including soft drink (weekday lunches are $13.95). The dishes were only described in French, Chinese and English, without Korean names, so I wasn't always sure what I was getting. But I ordered with abandon despite the $5-per-plate fee for wasting food. After some petite bowls of cucumbers with yuba, kimchee and dipping sauces, our friendly, if excessively relaxed, server sped out with our meat. Each portion was far more than we usually expect from an AYCEKBBQ place, so we had our work cut out for us. Surprisingly fresh white fish was an unexpected hit for us, especially dipped in the chile, cumin and fennel spice mix provided along with sweet soy-based and sesame-flavored sauces. The spice mix was similar to the dip that often accompanies Xinjiang-style kebabs. The marinated lamb was the most flavorful of the meats, dressed in a spicy sauce that recalled Chinese grilled skewers. I guess I shouldn't have been surprised. The restaurant does have a Chinese name, after all. Sadly, the bulgogi, usually my favorite, was lacking the big flavors of the sweet soy-ginger marinade that defines it. The galbi, or short ribs, were tender, but only slightly tastier. Even pork and chicken marinated in a fiery-looking red sauce were surprisingly bland. Worst of all was the beef tongue. Cooked at low heat, it's among the tenderest of meats. At the grill's high temperature, though, it turned into thin, flavorless circles of shoe leather. Overall, I was much happier with the cooked dishes. Once again, the ddukbooki (foreground), tasted more like a Chinese dish. The chewy rice cakes were the flat Chinese style rather than cylindrical Korean ones, and the spice came from a sauce other than sweet-and-hot gochujang (Korean hot sauce). Not bad, just different. The bibimbop was a highlight, however. The bowl of spiced pork, vegetables and a comically small raw egg yolk mixed into a delicious combination with a base of nicely cooked rice in gochujang. 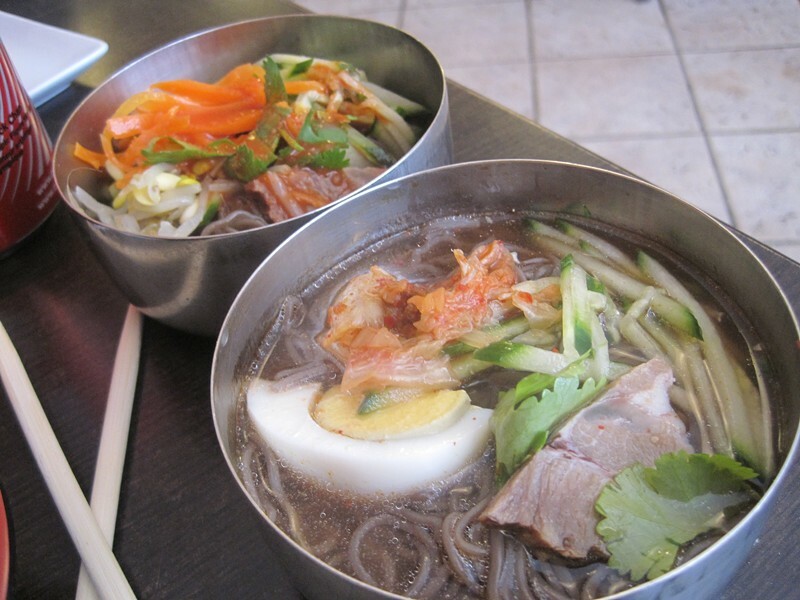 Best of all were two buckwheat noodle dishes. 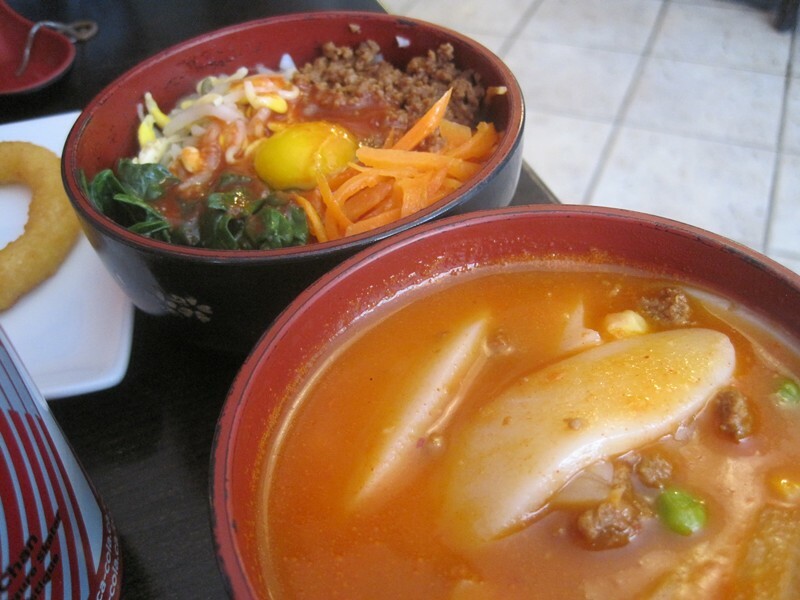 On a recent eating trip to Palisades Park, N.J., I became obsessed with naeongmyun, a tangy, chilled beef soup. Though this version could have used more musky, beefy taste, it was nicely balanced and benefited from fresh cucumber and cilantro as well as kimchee, egg and beef. The same toppings were on the other cold noodle dish, bibim guksu, which was missing the vinegary kick that should accompany the spicy gocuhjang. Even so, I considered ordering a second bowl. When I left, my fingers weren't giving off the telltale Korean barbecue smell I love (and often continue to sniff, pervertedly, for hours after a meal). But I'll likely return, primarily for the cooked dishes. I can see tiny bowls of jjajangmyeon (black bean noodles) and gamjatang (pork neck and potato stew) in my not-too-distant future.